How Can Flannery Safety Consulting Help You? 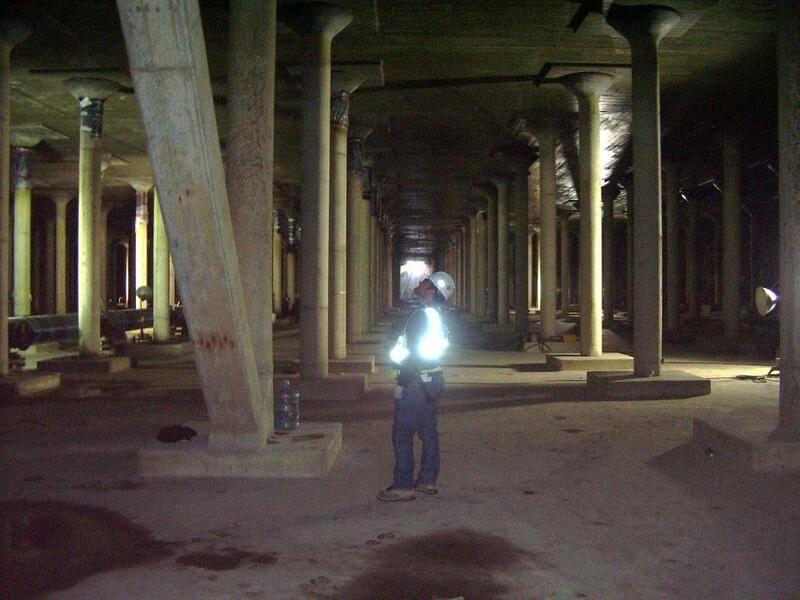 Flannery Safety Consulting offers clients safety consulting, training and management. Whether it be for building or improving your safety program, group training, or monitoring your safety activities, we can assist you in achieving your safety goals. So much of the safety world seems to be wrapped up in the negative, focussing on what can go wrong, how many injuries or incidents a company has had, etc. We strive to make your experience a positive one, looking at what is being done right and building on that. Jim Flannery is an NCSO and has worked in the construction safety field since 2000. He has worked for companies with as few as six workers as well as multi-national corporations, giving him a broad-based understanding of construction safety in a variety of scales and scopes. He has completed the University of Alberta’s Occupational Health and Safety certificate program, is a Gold Seal-certified Safety Coordinator and is a Canadian Registered Safety Professional (CRSP). Jim has a BA in English, has a quarter-century of construction experience under his belt both on the tools and off, and is a part-time freelance writer. 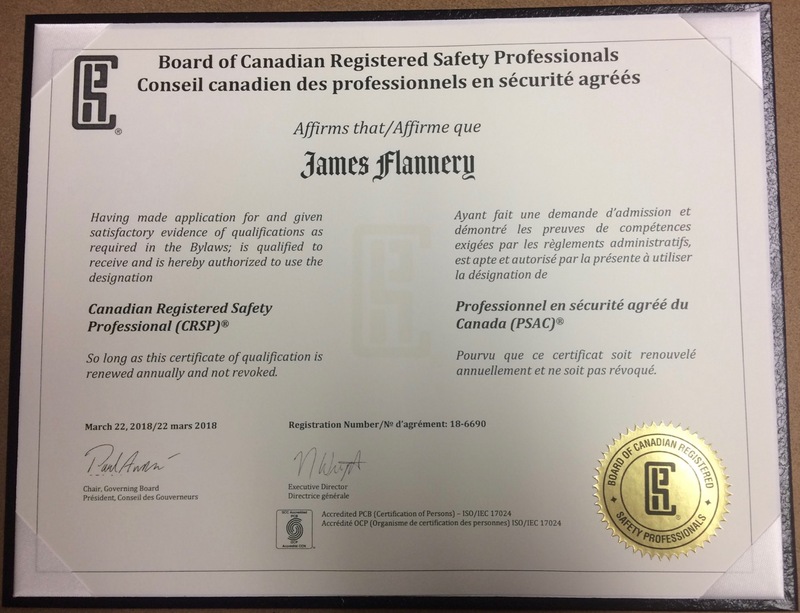 If you have any questions or inquiries, please don’t hesitate to contact Jim Flannery at jim@flannerysafetyconsulting.com or (403) 715-4162. This entry was posted in Safety on July 24, 2015 by Jim Flannery. Flannery Safety Consulting Turns 3! July 6 marks the third anniversary for Flannery Safety Consulting and it seems like things started just yesterday! Time has flown by over the last three years and a ton of things have happened. We have gone from a single client in the first few weeks to 16 active clients here in the summer of 2018. With the help of our association with BNI Key Connections, business has grown by leaps and bounds in a fairly short period of time and we’re so thankful for the opportunities presented to us! We have also invested heavily in training and constant improvement. During the first six months in business, we went through execuserv plus‘ Self-Employment program to make sure we have the tools needed to effectively service our clients. 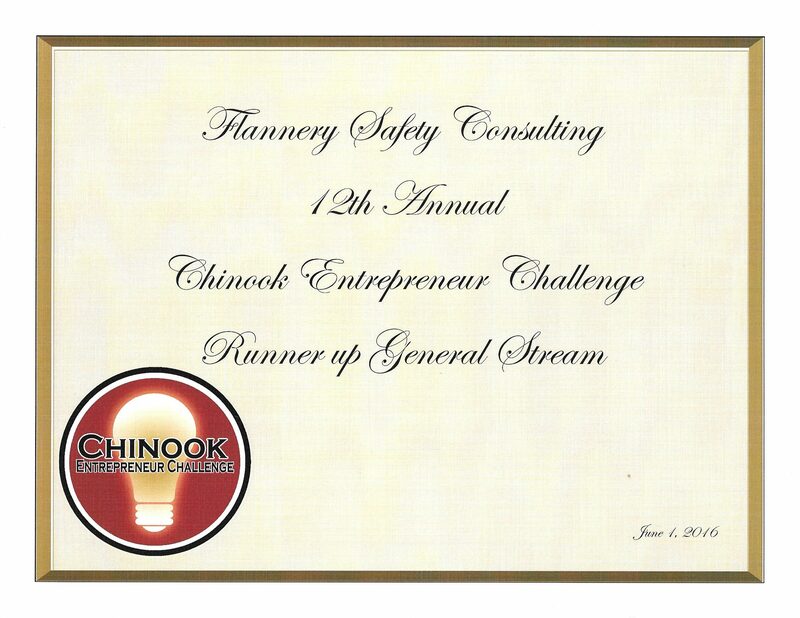 Following that training, Flannery Safety entered the 2016 Chinook Entrepreneur Challenge and finished as a runner-up in the competition. We have attended the ACSA’s annual safety conference four years in a row to stay current on key issues in the health and safety industry. 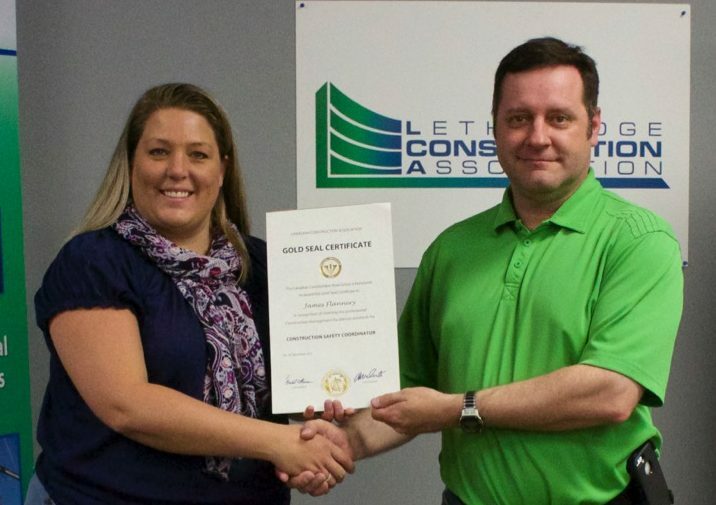 And we’ve added two new designations in the last three years—owner Jim Flannery became the first person in Lethbridge to write and pass the Gold Seal Certified safety professional exam in July 2015 and earned his Canadian Registered Safety Professional designation in the spring of 2018. It hasn’t been a perfect journey. There have been bumps along the road and hopefully we’ve learned valuable lessons on how to do our work better long the way. But the trajectory has continued to go in the right direction. And we have more plans to grow the business in the next few months! Flannery Safety Consulting remains committed to providing excellent service to our clients now and into the future. This entry was posted in Safety on July 6, 2018 by Jim Flannery. CRSPs are held to a high standard of ethical behaviour and are expected to commit to lifelong learning, to stay current with developments in the Occupational Health and Safety field. We’re honoured to have earned this new designation and hope it will continue to provide credibility to our company. This entry was posted in Occupational Health and Safety, Safety on May 2, 2018 by Jim Flannery. Flannery Safety Consulting Turns 2 Years Old! Flannery Safety Consulting turned two years old this week! It has been an interesting and challenging two years in business. Growing a client base came fairly slowly at first, but things are now quite busy, the bills are getting paid, and there are some interesting prospects on the horizon as the company’s business model continues to be refined. There have been a number of exciting developments since the start of Flannery Safety Consulting. Founder Jim Flannery earned his Safety Coordinator Gold Seal. He was the first person in Lethbridge, AB to get that designation. The company was runner up in the Chinook Entrepreneur Challenge in 2016. Jim spent a six-month term as the chapter president for BNI Key Connections, the marketing group where more than 80% of the company’s client base has come from. Jim has also been a member of the Lethbridge Chamber of Commerce’s Regional Direction and Policy Committee for more than a year. Along the way, Flannery Safety has given back. We helped out with a Habitat for Humanity project and took part in the Steps for Life event in support of families that have lost loved ones through occupational incident or disease. Through positive and proactive changes to a business’ methods, we can show you that protecting your people actually increases productivity and leads to greater profitability, which is good news for everyone! Lifelong training remains one of the company’s guiding principles. 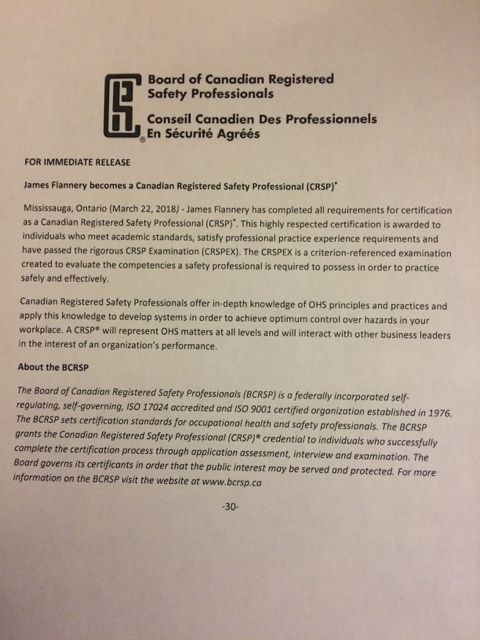 To that end, Jim is currently pursuing his Canadian Registered Safety Professional certification. He eventually plans to become a consultant auditor through the Alberta Construction Safety Association, adding another service to our list. This entry was posted in Occupational Health and Safety, Safety on July 7, 2017 by Jim Flannery. 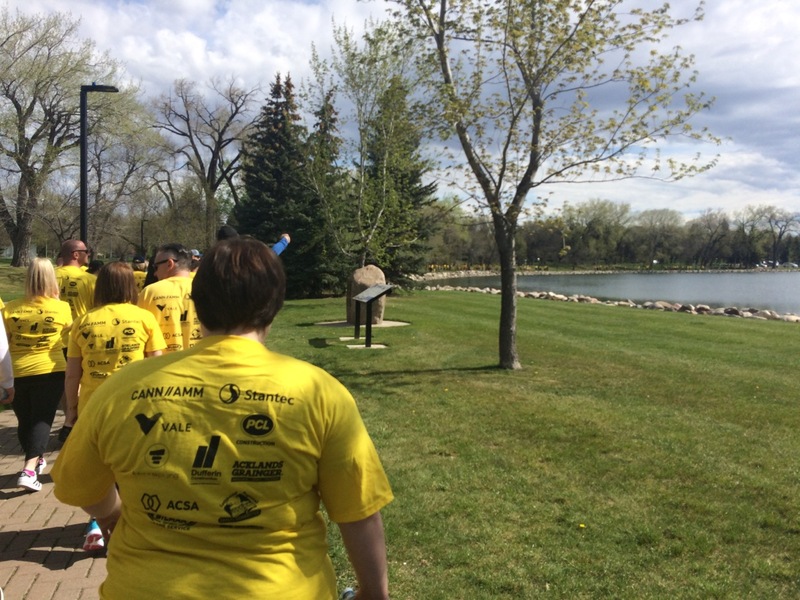 The Steps For Life walk in Lethbridge took place on the morning of May 6 this year and Flannery Safety Consulting took part. More than 1,500 people walked a route along Henderson Lake to support the cause. Lethbridge has traditionally been one of the biggest supporters of this fundraiser and 2017 was no different. The city’s walk featured 1,532 walkers—the most of any city in Canada—and has raised more than $40,000 as of May 8. That makes eight years in a row that Lethbridge has had the most participation in the country. Overall, the national Steps for Life campaign has brought in $654,157 as of May 29, which exceeds the campaign’s target for 2017, thanks to generous donations from communities all over Canada. 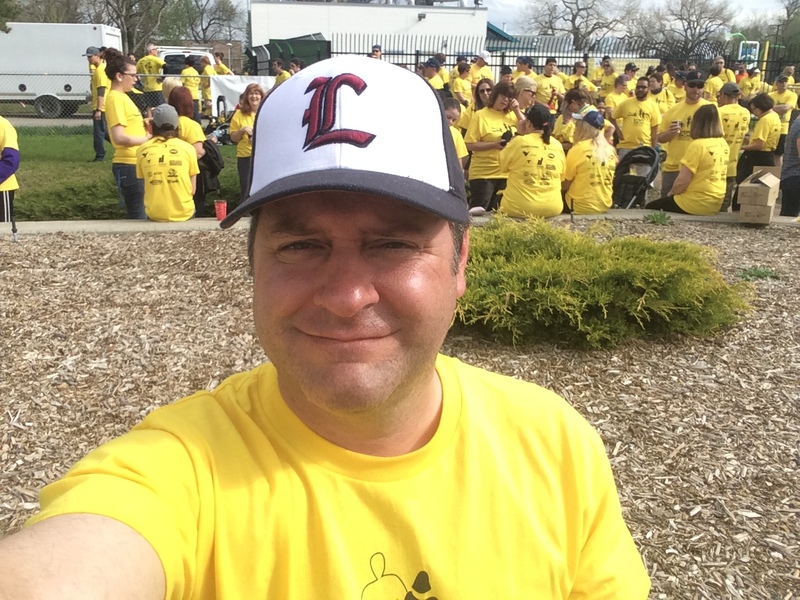 Flannery Safety Consulting is proud to have contributed to the effort this year and looks forward to the fundraising effort—and the walk—again in 2018. Thanks to the generous donors who contributed to Flannery Safety’s fundraising effort! Jim Flannery, owner of Flannery Safety Consulting, getting ready to participate in the annual Steps for Life walk in Lethbridge, AB. This entry was posted in Occupational Health and Safety, Safety on May 29, 2017 by Jim Flannery. 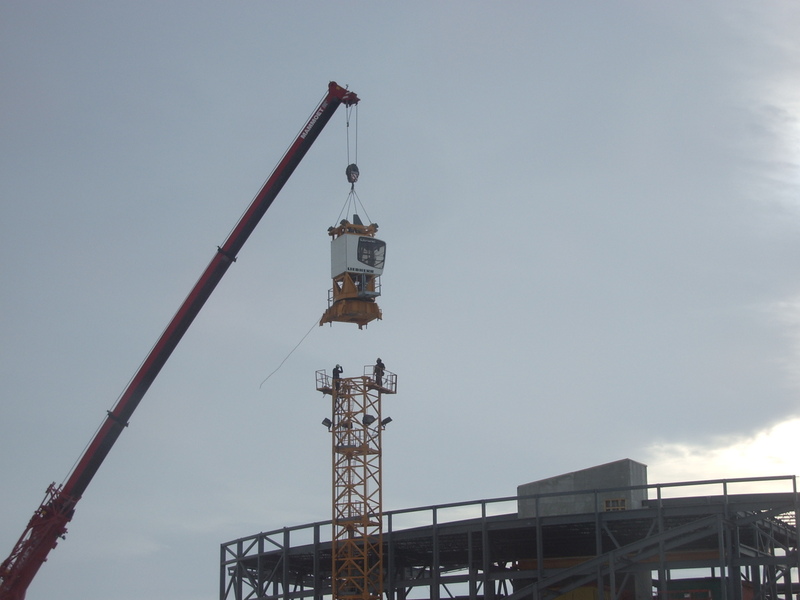 Don’t attempt a crane dismantle without a plan. Flannery Safety Consulting sets itself apart from the competition by emphasizing that in addition to worker safety, there is also abundant evidence that health and safety programs typically are quite profitable in a number of ways—a large Return On Investment in safety, decreased cost of projects, increased reputation, an increased ability for your company to bid on jobs, and many other benefits. By educating owners on the positives of a safety program—protecting your people protects your profits—better buy-in is obtained and better results are achieved. 39% report a decrease in project budget from a safety program, with a quarter reporting decreases of 5% or more. Only 15% reported that safety programs cost firms more—debunking the myth that safety has to negatively affect a firm’s bottom line. The bottom line is that assessing and controlling hazards can only be done effectively when a company plans its work. Companies with a good plan are more productive and make fewer mistakes; better productivity and fewer mistakes boosts profitability. Likewise, healthy workers are more productive than injured workers and, again, this boosts profitability. This entry was posted in Occupational Health and Safety, Safety on January 23, 2017 by Jim Flannery. An important part of my profession is identifying, assessing, and mitigating risk. When I’m working with businesses to help them develop or improve their safety programs, this is where much of the teaching time is invested as risk seems to be one of the most poorly understood concepts out there. The reasons for this are many but there seem to be a few recurring issues: we don’t necessarily recognize the risks until it’s too late, we frequently underestimate the level of risk for key hazards, we overestimate the risk for other hazards, and we assume that if we hear a saying enough times, it must be true. In this series of posts about common safety myths, I intend to talk about what the myth is, where it comes from, and why it is wrong. The first topic isn’t necessarily an occupational issue, but it is a myth that I hear frequently: Loud Pipes Save Lives. You’ll hear this saying spoken by owners of motorcycles, in particular from people who have specifically modified their bikes to be louder than the factory spec. The reasoning is that if other motor vehicles can hear you coming, they are less likely to run into you. This reasoning is the rationale behind setting your bike up such that it can be heard from blocks away, startling neighbours in their houses who are not the people you’re intending to protect yourself from. Not only is this myth 100 percent wrong, it actually puts bikers at risk by dramatically increasing their risk of permanent hearing loss (as the link notes, if your vehicle runs louder than 100 decibels, exposures longer than 15 minutes could result in hearing damage). From a pure physics standpoint, the notion that loud pipes save lives is unlikely. 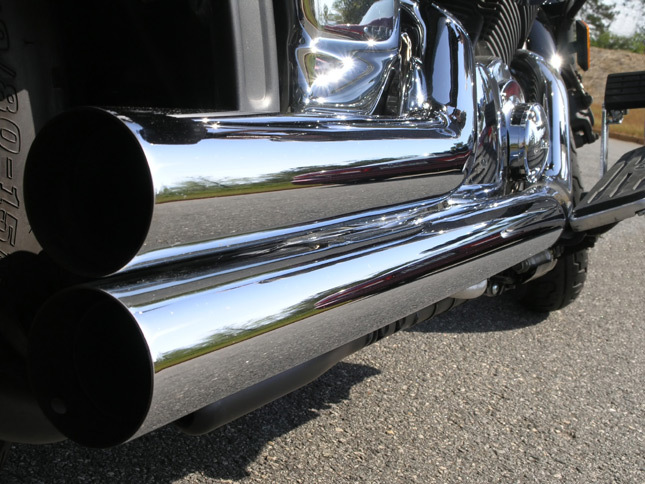 As noted in this article, because a motorcycle’s pipes are directed backward, the sound from those pipes is also directed backward; 77 percent of all bike hazards (ie. other vehicles) are in front of them, but vehicles in front of the bike won’t hear it until it’s either next to or in front of the other vehicle. If you’ve ever been startled by a loud bike coming alongside your car when you didn’t see it approaching from behind you, you know this to be true. The gold standard when it comes to analysis of motorcycle accidents and causes is the Hurt Report, published in 1981 and written by Professor Harry Hurt, along with J.V. Ouellet and D.R. Thom. The five-year study examined the police reports of more than 900 motorcycle crashes and summarized 55 key points with regards to the outcomes of the incidents. The word “noise” does not appear in any of the 55 points. The word “loud” does not appear, nor does the word “pipes.” In a study of over 900 bike crashes, not a single mention of noise being a factor is noted, not as a cause of incidents or as a preventative measure to prevent them. To sum up, if you, as a motorcycle rider, want to maximize your chances of survival, get yourself some driver training and make yourself as visible as possible. I recognize that going to school and wearing colours other than black aren’t the sorts of things “cool” people might do, but education and hi-vis saves lives. This entry was posted in Health, Safety on July 5, 2016 by Jim Flannery.